Growing up in America's Dairyland, I developed a love of milk early on. Both my parents were raised on dairy farms and drank milk right out of the bulk tank. My grandfather drove a milk truck after he retired from his dairy farming operation. Many of my friends had to get up early to do chores. Dairy farming is still an important part of the economy in our rural area of Wisconsin. 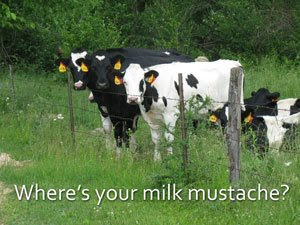 So, the cows pictured to the left are wondering: where's your milk mustache? Danica Patrick, Dara Torres, Trisha Yearwood, Brooke Shields and many other famous faces have sported the look. The website http://www.whymilk.com, geared toward women, explains the importance of including milk in your diet. (Also, follow on twitter: milkmustache) Milk is filled with all sorts of essential nutrients including including calcium, protein, potassium, and vitamin D.
Beat milk, cornstarch and egg and sugar together with whisk in a medium saucepan. Cook on medium heat stirring constantly until pudding thickens and begins to simmer. Remove from heat. Stir in vanilla. Can eat warm or chill in refrigerator. We like to add a few chocolate chips to our warm pudding to make chocolate swirls. "Milk is naturally nutrient rich like no other beverage – it's nature’s wellness drink!" Get on the path to wellness and visit whymilk.com to learn more. I think I'll make you chocolate swirl version with the kids later this week. Thanks for the recipe! When we were in Wisconsin we had no trouble getting all the dairy products we could handle, because it was all so delicious. The cheese is the best anywhere, and of course there's milk in frozen custard......!!! We make a trip back at least once a year - we call it our Cholesterol Pilgrimage! I just wanted to let you know that I have an award waiting for you on my blog :) Have a great day! Yes, yes, bring on the WISCO dairy products. Yum, yum. Decompressing ... BlogHer09 had me hopping! Oh My! Tons of winners! Who's the winner now? Find out.